Let’s think “outside the box” is such an overused term these days. But the reality is that it still works. 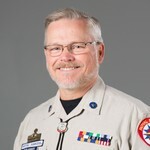 New Mexico District Director Ted Schmidt wanted to host an NEEC. He was having difficulties finding a venue that could do everything we needed for this conference and still be cost friendly. He finally called me and asked what else he could do. It just so happened that Indiana had asked the same question. This gave birth to the hybrid NEEC where everything is held at a church, and the trainees get their own lodging at local hotels. The Indiana pilot was held on October 26-27. However, the New Mexico hybrid was first on August 16-17. With a small staff of seven instructors and two cooks, we hosted 25 trainees at the Tramway Community Church in Albuquerque, NM. Because of the format of this hybrid conference, trainees from New Mexico, Texas, and Wyoming were able to attend. Some shared hotel rooms, while others bunked with friends in the area. We learned a lot from this first foray into a non-lodging NEEC and expect to learn even more from the hybrid that took place in Indiana. Regardless what the weather threw at us—yes, it even rained Friday evening—with the able assistance of Ted Schmidt, the staff was able to teach and minister to our 25 trainees. I’m glad to say that our trainees included not only male and female Rangers leaders but also three Girls Ministries leaders. There were also pastors in attendance. We even had a lady who had recently retired from teaching Ranger Kids for 40 years attend and ultimately earn her Advanced Level in OLAL. As we work out the obstacles for hybrid events like the NEEC in Albuquerque and Indiana, we will continue to think “outside the box” to provide training where it otherwise would not have been possible before.